A few weeks ago, commenting on the New York Times’ coverage of Wesleyan’s financial aid woes, we wrote that this was likely the first many alumni were hearing of changes to Wesleyan’s need-blind status. 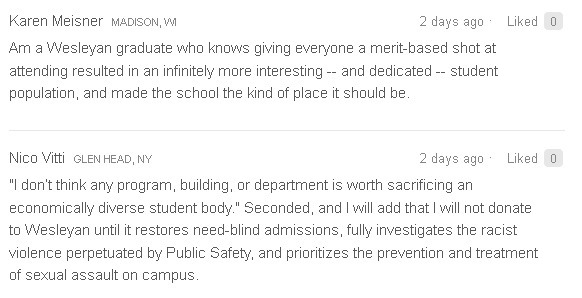 Following a Q&A with the Board of Trustees in November, chairman Joshua Boger ’73 assured A-Batte and me that the great majority of alumni are aware of cuts to need-blind and enthusiastically approve. A new petition by Lana Wilson ’05 suggests otherwise. Since it doesn’t explicitly call for a halt to alumni donations, Wilson’s petition will likely be less controversial than the last one. Its signers, though, have made their own decisions with regard to giving. “This change in policy has made me seriously reconsider ever giving back to Wesleyan University,” a supporter writes. “I will add that I will not donate to Wesleyan until it restores need-blind admissions, fully investigates the racist violence perpetuated by Public Safety, and prioritizes the prevention and treatment of sexual assault on campus,” a recent alumnus concurs. 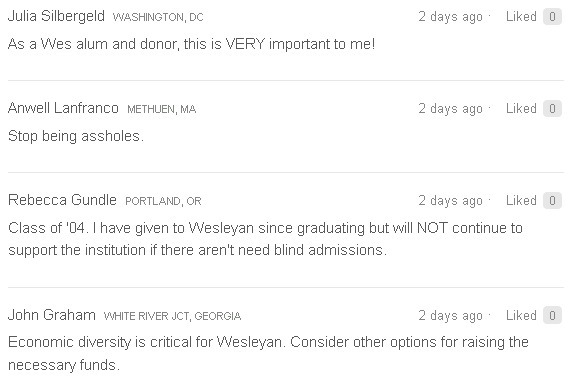 Like many alumni, I was shocked and then saddened by the recent decision to stop offering need-blind admission to Wesleyan. This would be a fundamental change that I hope you will reconsider. I appreciated your recent Wesleyan 2020 update, in which you outlined all of the cost-cutting you have done already, along with the long-term goals of curbing the rise in tuition, reducing student debt, and fortifying the endowment, which you felt cumulatively justified this decision. None of this matters, though, if Wesleyan doesn’t maintain its commitment to economic diversity in the student body. Without that, the education of all students who go there will be seriously weakened. You estimate that 90% of Wesleyan admissions will remain need-blind, and that only about 10% will be affected by this decision. But the impact is much broader than that. Let me explain my objection in very practical terms: When there are so many other excellent liberal arts colleges to apply to, and when college applications are expensive—costing between $50-$90 per school—why would some meritorious lower-income students spend their limited resources applying to Wesleyan in the first place when they know the university could reject them simply because of their financial situation? These people would be given a fair chance at other, need-blind colleges, which—unlike the Wesleyan of the future —guarantee they will not be judged based on how much money their family has. For this reason it seems unavoidable that eliminating need-blind admission will mean fewer and fewer merit-worthy lower-income students applying to Wesleyan. I decided to go to Wesleyan because, compared to many other competitive liberal arts colleges, its student body was remarkably diverse. People came from incredibly different backgrounds and situations, including different economic classes. Restricting the range of backgrounds represented at Wesleyan limits the amount of learning students can do from one another. Moreover, it makes the campus less appealing for potential students, who choose Wesleyan not for classmates with similar privileged economic backgrounds, but with merits that have earned them their admission. This is a false choice. You don’t have to raise tuition to ensure that you are running a “great university.” You also don’t have to stop Wesleyan’s longstanding policy of need-blind admissions. You simply have to cut more costs or raise funding elsewhere. I don’t think any program, building, or department is worth sacrificing an economically diverse student body. Rejecting students based on their family’s finances will ultimately lead to less intelligent, less accomplished, and less interesting students. And less outstanding professors will be attracted to teach them. It’s nice to have a new campus center and better dorms, but are these things really what bring people to Wesleyan? No—people come to Wesleyan, above all, because of the other people who are there. Since this decision was announced, I’ve heard from many alumni who are upset by the fact that no fundraising effort was ever made to save our treasured need-blind admission. This is true—if the administration had told alumni that unless they donated, need-blind admission would end, I’m sure there would have been an enormous effort to organize and help. Now, I have read letters and articles by many alumni who are planning to stop the regular donations they make to Wesleyan, or cut the university out of their wills, because they are appalled by what feels to them like a betrayal of one of Wesleyan’s most important principles: its dedication to admitting students based on merit instead of money. It’s too late to fundraise to “save” need-blind admission now. But you can still restore need-blind admission, cut other programming and facility costs to make up the budgetary difference, and then fundraise from alumni to compensate for those cuts. If alumni are told that their help is needed to cover cuts that were made to maintain need-blind admission, I’m sure they will respond. I and everyone who has signed this letter hopes that you will do the right thing, and continue Wesleyan’s practice of admitting the best students possible, rather than those with the most personal wealth. We would appreciate your serious consideration and response to our appeal. Posted by Zach in Administration, Admissions, Alumni, Featured and tagged activism, Administration, admissions, Alumni, alums, change.org, financial aid, lana wilson, michael roth, need blind, petition, President Roth, protest, Roth, slacktivism on December 22, 2012 at 10:00 AM. Boger said that alums are behind this change? That sounds like a bold-faced lie. Every alum I know thinks this is unthinkably prejudice. Don’t believe that for a second.